The Internet has become an everyday part of our lives. We use it daily as a tool to improve teaching and learning, to access information from around the world, talk to friends and help with our work. It is an immense environment offering a wealth of resources that benefit us all. However, it is essential that we all learn how to behave responsibly online both at home and at school. 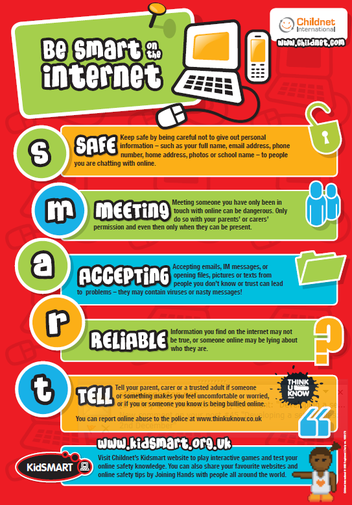 At Mountfields Lodge we know how to behave online and how to keep ourselves safe by following these SMART rules. For more information on how to stay safe online please go to our 'Parents' tab on this website and choose the 'Useful Links' option.